Cross the Sky is a group of people who create music, drama, and worship resources for youth ministry. Our focus is on God’s grace and the call of Christ to live faithful, loving, sacrificial lives in our world today. We hope you find our site useful and refreshing! Music that’s easy to learn and sing. Songs that are spirit-filled and scriptural. Skits that are fun, faith-filled, and support real church ministries all year long. Resources designed for youth-led worship, plus music, skits and creative ideas. Mime dramas designed for special youth events at church or on mission trips. Order CDs, songbooks, worship resources, skit books, worship settings. QT Quiet Time Devotions. New Music. Creative worship ideas. More! New album of music for youth ministry! 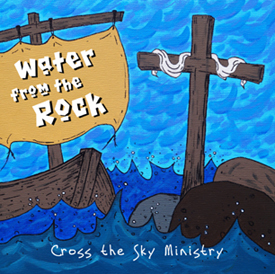 Water from the Rock includes 12 new songs of faith in Jesus Christ. The music supports a mime drama about Peter and the disciples as they seek to follow Jesus Christ as their Savior and Lord. The drama is based on 12 original songs written by the friends of Cross the Sky Ministries. A director’s booklet for the drama will be available soon. You can order a CD from our website. Go to the Water from a Rock page for more information about this new project. It’s a set of our 25 most popular songs for youth worship. The music also supports the “Youth Sunday” resource book with seven worship services for youth to lead in church. Includes skits, songs, worship settings, and lots of creative ideas. New resource for youth and family ministry! 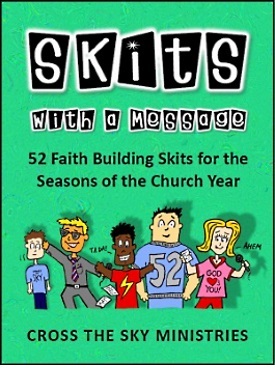 Skits With A Message includes 52 skits for youth ministry. There are skits for every season of the church year; Advent, Christmas, Epiphany, Lent, Holy Week, Easter, Pentecost, and Thanksgiving, plus many more. Each skit includes scripture texts, a brief message, discussion questions, and a prayer.